If you know me, you know that while I love people, I rarely connect with people on a really deep level. I'm a bit picky. I'm sort of like a friend snob. And after reading this, I'm sure I'll be off your BFF list. I'm okay with that. Unless you're a part of the Carnahan family. Tim and I considered ourselves blessed to be able to spend an evening with Rick, Becky, and their four teenage sons. Aside from their addicting family dynamic, Rick is known at our church as the pizza master. He's a genius. And like I said, I'm in love. Don't get me wrong-I'm not talking about a Marvin Gaye love. I'm talking about that "oh-my-gosh-this-man-loves-to-cook-more-than-me" love. I'm getting carried away. Let's just say we were kindred spirits. Now, one little bump in our relationship was when Rick explained to me that he would not share any of his dough recipes, as they're some of the best you'll ever eat. I didn't get it. Why wouldn't he want me to splash his super-secret, super-famous recipes all over the web. Because. This man is going to be the next big thing. Mark my words. Regardless, I did learn a few great tricks from Rick about pizza-making, and I'd like to share them with you. Rick has also generously offered to teach me how to make the dough of my choice in the near future, so when that day comes, I will show you all what I learn. Until then, let's just skip over the dough and get into some nitty-gritty details. First lesson: Cheese. Instead of buying a bag of shredded cheese, Rick takes big slices of every cheese under the sun and places small chunks all over the pizza. He also adds dollops of ricotta and mozzarella. When it cooks, the cheese spreads, and it creates almost a chewy cheese pizza instead of stringy. Genius. Lesson two: Pepperonis. Rick is somewhat of a health nut, as he was sharing all his little "insider" tips and tricks about the nutrition of different foods. He says he just reads a lot; I say he's saving me the trouble. And you. What Rick does with the pepperonis is he takes a plate and places a paper towel on it. 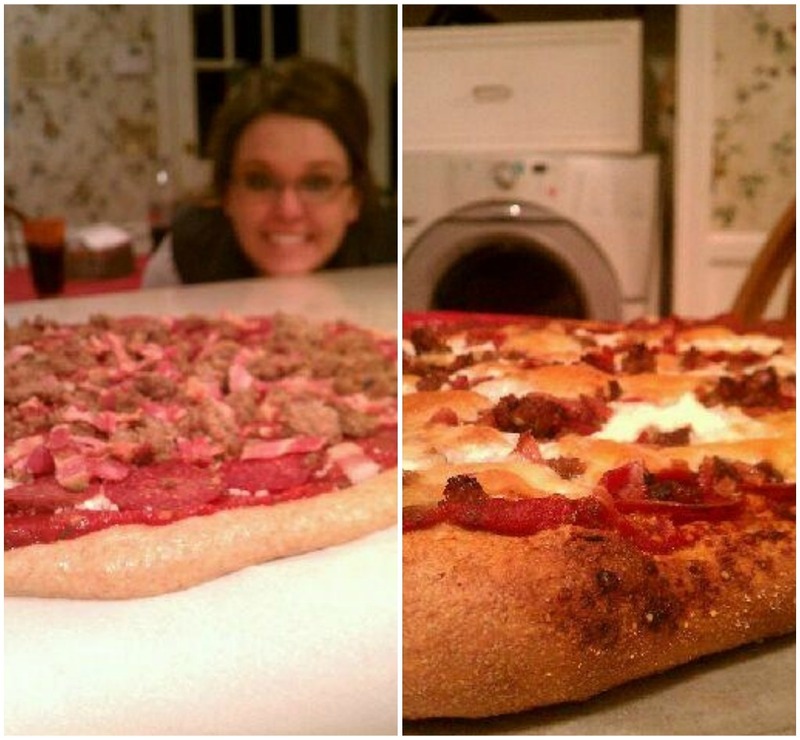 He then layers it with pepperonis, and puts another paper towel on top of that. He continues to layer this about 6 times and then microwaves it for 5 minutes. He immediately removes the plate from the microwave and presses down on the top of the pile with a paper towel, then removes the pepperonis so they don't stick to the paper towels. 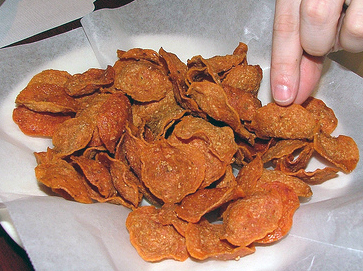 After letting them sit for a few minutes, they become crispy and are called pepperoni chips. Serve in a bowl next to a big bowl of pizza sauce as an appetizer. So good. Lesson three: After the fact. Once the pizzas were done cooking, he let them sit for a few minutes, saying they needed time to "settle." I don't like to settle, but apparently it's important in the pizza-making business. And you know what? It was spectacular. In conclusion, Rick might never give me the recipe to his life-changing doughs, but he can't stop me from showing up on his doorstep, begging for a slice. What a great time. I mean, seriously-in what situation are you bummed when your dinner host hands you two huge, homemade pizzas to take home with you? We have had the pleasure of spending a few afternoons or evenings with the Carnahans too. They are so hospitable and his bread, pizza, everything we've ever eaten that he's made has been fabulous. One could learn so much about hospitality and food from the Carnahans. oh yeah....I can taste it now.... everything is incredible-don't forget his homemade sauce too! LOVE IT! and love them! We got some homemade vegetable beef soup from them for Christmas. I felt like I was getting healthier with every bit. So satisfying.